A recent conversation with a client helped to crystallize a dynamic that I see regularly, both with my MBA students at Stanford and with most of the clients in my coaching practice. Think of all the possible claims on our attention--work to be done, messages to be sent, events to attend, and all sorts of people who want some of our time. Now stack-rank each of these claims in order of their importance. This results in the (highly abstracted) graphs below. 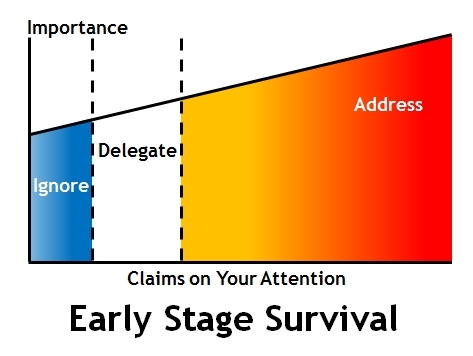 In the early stages of our career, survival requires that we address most of the claims on our attention, because the gradient distinguishing the most important from the least important is relatively shallow. We can delegate a few tasks, but we may not have much help, and we can ignore others, but not that many. This holds true for leaders of early stage organizations as well. Most of my clients are startup CEOs, and in the first few months (and sometimes years) after launching the company, this is what their world looks like--every task and issue seems important, there aren't many other people to delegate to, and it seems perilous to ignore things. As the leader, they feel responsible for addressing almost every possible claim on their attention. But later in our career, things change. The gradient distinguishing the most important claims on our attention from the least important becomes much steeper. The most important are really important, and everything else matters much less. We're able to delegate more, because we have additional resources, and we're obligated to ignore more, because the number of unsolicited requests skyrockets. 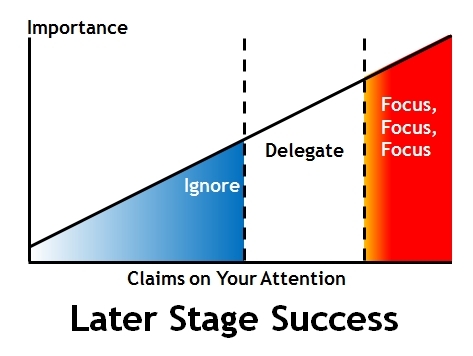 The key to later stage success isn't addressing a wide swath of responsibilities, but rather focusing relentlessly on the most important ones. The same process unfolds for a startup CEO as the company emerges from survival mode. It becomes easier to identify the tasks and issues that truly merit their attention, there are teammates in place to handle work that can be delegated, and it's now perilous not to ignore things, because time and attention are so precious. The key step is recognizing that this transition is under way and evolving our approach to work accordingly. Sometimes the shift is obvious, such as when we step into our first leadership role or when the scope of our job increases. But often the shift is subtle and easy to miss, particularly for leaders of fast-growing organizations. What works for someone leading half-a-dozen people doesn't work for someone leading 20, and what works at 20 people doesn't work at 200, ad infinitum. But that growth doesn't come with automatic milestones telling the leader to adjust their management style. Leaders must be attuned to shifts in the organization around them and the resulting changes in the claims on their attention. And note that adjusting our management style to reflect these changes isn't merely a cognitive process, but also an emotional one. As I've written before, "Actively ignoring things and saying no to people generates a range of emotions that exert a powerful influence on our choices and behavior. This is precisely what makes triage so difficult, and until we acknowledge its emotional dimension, our efforts to control our workflow through primarily intellectual interventions are unlikely to succeed."